ISO paper standards are widely used. Originally for the litho and screen print industries where sizes need to be fixed they are still used extensively in the large format digital printing market although Large format digital printers use rolls rather than sheets of paper. 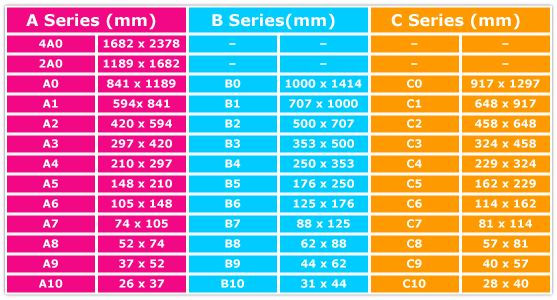 This is due to the fact that most of the shelf display hardware for exhibition, retail and advertising are manufactured to take these set poster sizes. Poster frames, Billboards, Pavement signs come in set sizes. This is not offered as part of our standard service. The majority of orders are ganged together to achieve "economies of scale" and printed using industry standard density settings which may still produce a variation in colour, between print runs, due to atmospheric conditions and varying stock properties. Images should ideally be CMYK at 300dpi for the intended final size of the image. Please be aware of the "Total Ink Cover" you intend using in your design. The heavier the cover the longer it will take to produce your job as this will affect trimming, folding and packing by potential scuffing. We recommend no more than 300% coverage out of a possible 400%. (i.e. CMYK @ 100% each). You may wish to consider a sealing coat if you have concerns. We do recommend this for matt stocks. Black 100%, Cyan 50%, Magenta 10%, Yellow 10%.